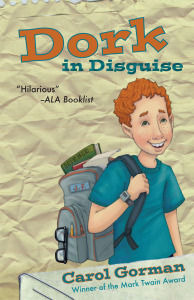 Starting middle school in a new town where nobody knows him gives Jerry Flack the chance of a lifetime: he can change his image! He spent the entire summer studying how NOT to be a dork, and Jerry will present himself on the first day of school as a Cool Guy. But he finds out that’s easier said than done. His lies are piling up quickly, and he knows he’s bound to slip up soon and show himself to be the dork that he really is. Can he keep the disguise going? Or is it possible that a dork can actually be…well, cool?